Mrs. India Worldwide is produced by the IFC, based in New York City. The IFC is a pioneer organization in conducting Indian pageants and fashion shows in the USA and worldwide. The committee has been conducting Miss India Worldwide since 1990 and Miss India New York and Miss India USA Pageants annually since 1980. In the year 2016 to mark the Silver Anniversary of Miss India Worldwide, Mr. Dharmatma Saran, Chairman and Founder of Miss India Worldwide, introduced for the first time Mrs. India Worldwide. The pageant was an instant success from the first year. It is the only authentic Indian pageant for married women as only one lady from one country represent their respective country in the pageant. Earlier, Mr. Saran introduced Mrs. India USA in the year 2013 which was a grand success. The IFC selects distinguished local organizations in various parts of the world and authorize them to conduct national pageants in their respective countries. Most of the National Directors of Mrs. India Worldwide are the same who have been associated with us as National Director of Miss India Worldwide. Needless to say, they all are experienced and experts in organizing pageants. IFC reserves the right to select a contestant through audition from a country where there is no national pageant. 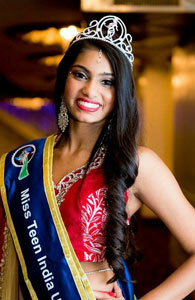 At this time Mrs. India Worldwide is conducted in conjunction with Miss India Worldwide. The contestants are of Indian origin, of any age, and are citizens, residents, or born in the country which they represent. Applicants can be married, widowed, divorced with or without children. The idea is to empower Indian women around the world irrespective of their marital status. The IFC motivates and guides its winners and contestants to take up charitable causes. The pageant consists of three segments – Evening Gown, Indian Dress and Question/Answer. The winners of all the various national pageant from all over the world vie for the glamorous and prestigious title of the Mrs. India Worldwide.